Today is the Feast of St. Cumine the White, abbot of Iona. Not much is known of this monastic saint. He was the seventh abbot of Iona, the monastic community on one of the Hebrides — a series of islands off the west coast of Scotland. He was nephew to Segenius who was the fifth abbot of Iona. During his tenure, he visited Ireland about A.D. 661, the Synod of Whitby took place, which declared that Northumbria would follow the practices of Rome when it came to tonsuring and the calculation of when to celebrate Easter, and the Book of Durrow was completed. 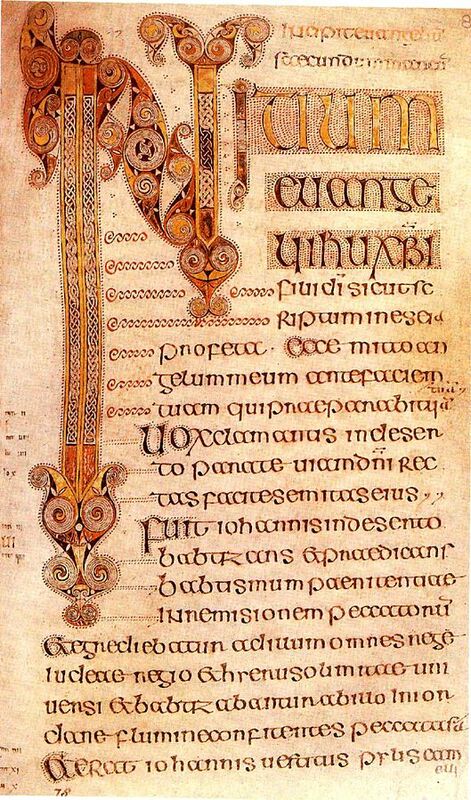 The Book of Durrow is the oldest extant insular illuminated gospel, over a century older than the Book of Kells. 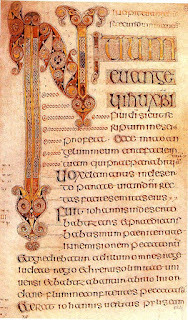 While there is much academic debate over where this text was created, one of the contenders is the Iona of St. Cumine. He also wrote the Life of St. Colum Cille. He died in A.D. 665 after being abbot for 8 years. Despite the fact the St. Cumine’s hagiography is so thin on details, I find it so inspiring that I am actually going to have to limit myself. I could wax poetic on how the moniker “the White” sounds very Tolkien or how awesome something similar to the Synod of Whitby would be as background noise for a campaign. The Hebrew reflects the eternal enmity between humanity and the devil. The Latin is a prophecy of the Virgin Mary. The Greek is a prophecy of Christ. The retro-clone Delving Deeper has clerics memorize spells the same way magic-users do and I have always wanted the spell Read Magic to be something far more important than merely a spell every magic-user has because it uselessly is a prerequisite for writing spells into a spell book. In this re-skinning, the difference between “divine” magic and “arcane” magic is not the source of the magic, but rather the language. In the same way that the Hebrew, Latin and Greek bring out different aspects of Genesis 3:15, the language used to do magic brings out a different “type” of magic. Arcane magic uses a complex language that is both difficult to learn and results in powerful magics. Its practitioners spend so much time learning the language that they don’t have the time to train with armor or most weapons. Divine magic uses a far more intuitive language that, while easier to master, does not produce the powerful magics the arcane language can. As a consequence divine magic practitioners do have the time to train with armor and (some) weapons. One could even extend this out to other various spell-casters like druids and illusionists. Since the mechanism of all magic is the same — language written in spell books — this gives us the opportunity to give Read Magic a really interesting twist. Rather than simply being a spell that every magic-user has and is the mechanism for writing spells down in a spell book, it is a spell that can allow a practitioner of one type of magic to memorize a spell from another language — another spell list. Due to the fact that this spell is being memorized via a spell rather than by actually knowing the language, the spell takes a spell slot one level higher than normal. For example, if a magic-user wanted to memorize Cure Light Wounds it would count as a 2nd level spell. This, in part, explains why certain spells that appear on more than one list are different levels depending on the caster. For example, Hold Person is a 2nd level cleric spell but a 3rd level magic-user spell. In other words, this spell was originally in the language of divine magic, but was well known enough by arcane users to be translated into the arcane language — as a 3rd level spell. Thus, Read Magic becomes a really important spell that every one will want rather than the spell that simply takes up space and no one bothers to ever memorize. This re-skinning also offers all kinds of interesting possibilities in terms of how magic interacts with a campaign world. Rather than having different schools of arcane magic-users, the different schools teach different languages and therefore result in different classes. Each type of magic might bring with it a different culture. One could go so far as to have entire nation-states based upon a different type of language and thus a different type of magic. Thus, a wizard with the name and moniker Cumine the White might be a magic-user, a cleric, a druid or an illusionist depending on the language he uses to study magic. Recently, I have gotten a couple of compliments for stuff I’ve done in the hobby. Firstly, one of my friends sent me an email thanking me for getting him back to the gaming table and for doing all the prep work necessary for running a game. 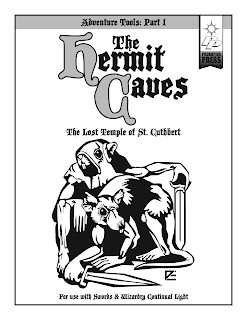 Secondly, Ifryt, who writes Miasto ze Spizu, a Polish-language RPG blog, recently ran my adventure The Hermit Caves and wrote up a nice little review. I had to run it through Google Translate, but he liked the module for all the reasons I wrote it, which thrills me to no end. While I am tooting my own horn here a little bit, I find the juxtaposition of these two comments actually really interesting because of the rather large difference between how I write an adventure to publish and how I prep to run an adventure. While my writing and layout style is quite different from the traditional module, I am nonetheless heavily influenced by the way modules have traditionally been presented. Part of me wonders if Referees, when prepping their own adventures, feel obligated to (at least in part) duplicate what has been published throughout the years. Since I run a sandbox-style game and my schedule is filled with family, job, church, etc. I long ago realized that I cannot prep my adventures like a regular module. I don’t have time and my players may never actually go where I do all that hard work. Therefore, I have developed a shorthand of adventure prep and have a copious collection of random tables. Note: I typed this out so you could read it (my handwriting is awful). One thing that I believe gets overlooked in Moldvay’s Basic is that he provides an average value to Treasure Types A-M. This gives me the freedom to arbitrarily assign treasure based on average value rather than rolling on the treasure table. It also allows me to use resources like The Mother of All Treasure Tables (MoaTT), originally published by Necromancer Games, which provides various treasure troves valued at 10 gp all the way to 50,000gp. Thus, I have noted at each room with treasure a roll on the tables in MoaTT. Why are the monsters in this room? Why is the treasure in this room? What do they think of the party? Why a trap here? What trap is appropriate? What weird thing am I in the mood to have be a Special? This is really all the information I need to run a successful dungeon delve that brings with it surprises for both my players and myself. In a way, I am exploring the dungeon with my players since much of the information that might have appeared in a grey box in a module of old, I am making up on the spot by answering questions either my players ask or I ask of myself. In other words, the amount of work I put into prepping an adventure into The Liar’s Cave pales in comparison to the work I put into The Hermit Caves, yet both can (and have) produce(d) great gaming sessions. So, to all those yet-to-be Referees (and maybe to those who already are): you don’t need to go to the lengths of a written module to produce great adventures of your own. You don’t need to feel intimidated by all that flavor text and all that background information and all the crunch. If you are willing to be creative, accept the surprises and seemingly nonsensical results that random tables can provide and be comfortable with the reality that if it makes sense to you in the moment, it will most likely make sense to your players, you can jump into the world of Refereeing with as little as a piece of paper with a rough map, a few monster stats and some random tables and still be just as effective as if you’d written everything from scratch. This year, in the Orthodox Church, an unusual occurrence happens. 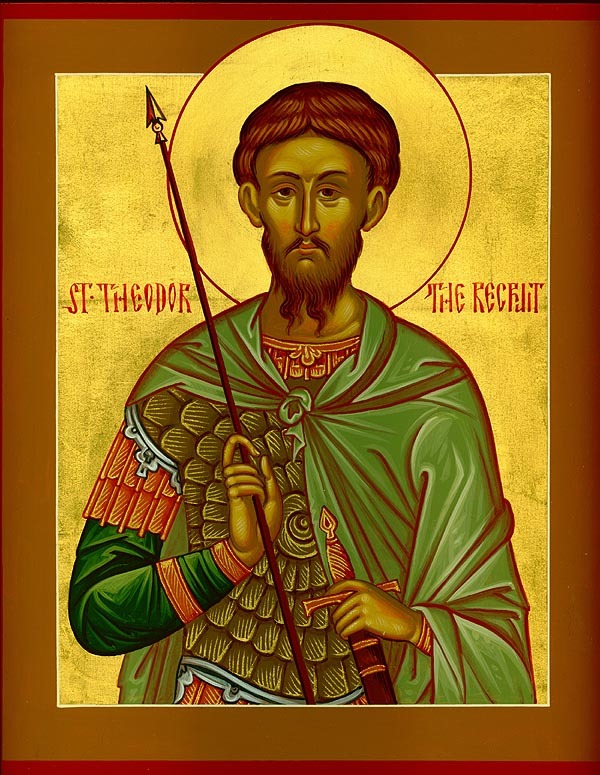 We get to celebrate The Great Martyr St. Theodore the Recruit (sometimes rendered “Soldier”) two Saturdays in a row. February 17th is the Feast of St. Theodore and we also always celebrate him on the first Saturday of Lent (of which I write about here) which falls on February 24th this year. St. Theodore was a soldier in the Pontine district of Asia Minor (northeast Turkey along the Black Sea). When his commander ordered him to sacrifice to idols, he refused. The saint was given several days to reconsider, during which time he set fire to a temple dedicated to Cybele, “the mother of the gods.” For this he was tortured and sentence to burn to death. He boldly stepped into the fire, and though he gave up his sprint, his flesh was not burned. There is another St. Theodore who is also a Great Martyr and who also is a soldier. Thus, each is given a different moniker to differentiate the two. Today’s Theodore is called “the Recruit” and the other is called “the Commander” because of the different ranks they held as soldiers. 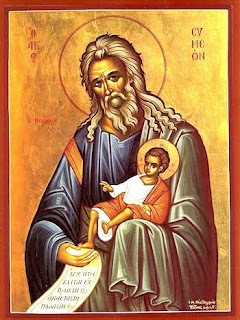 There is a bit of confusion, however, when it comes to the moniker “The Recruit.” In the Greek it is “Tyronos” which comes from the Latin “tiro” meaning “recruit.” In Greek, when one reads the Feast of the Day, the name of the saint of always in genitive — the 17th is the feast of Theodore the Recruit. Therefore, the “the” in “the Recruit” is also in genitive. Since “tyronos” is Latin, not Greek, is sometimes mistakenly understood to be a place: St. Theodore ofTyronos. Of course, there is no such place (at least that I or Google Maps are aware of). There is, however, the city of Tyre in modern-day Lebanon. In the genitive is is rendered in Greek “Tyrou” — close enough that might the two might be conflated. 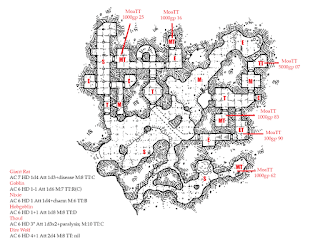 There are plenty of examples of folks out there that have posited re-skinning the Lost Caverns of Tsojcanth, The Tomb of Horrors and other classic modules as the end-goal of a campaign-long quest (especially if the said dungeon holds within it a critical magic artifact that several different factions want to get their hands on). Imagine if there existed a map or a legend or a song that was believed to be the key to finding said quest-ending dungeon. Here is where language becomes very important: as with St. Theodore’s moniker having multiple meanings depending upon grammar and language, this map/legend/song would have a different meaning depending upon which language thought to be its origin. Thus, depending upon whether or not the party has access to Dwarfish, Elvish, Orcish, etc. the map/legend/song points in a very different direction. The others left me to pray today. They go to scout out the area they think the spiders are with the intent that we will raid their lair. We hope to rescue Holton before they carry out their threat to eat him (if, indeed, they haven’t already). Besides which, Morivam's curiosity has him suspecting everyone in the bishop’s murder and he figures that I should get to know “my future flock” (as Cuinn smilingly calls them). I must admit, it has been so long since I have had the time to just sit and pray to my heart's content. At times like these, one remembers how important prayer actually is. My calling is here. Now. I reminded myself that letters still needed to be sent to Fr. Valinor and the Bishop of Trisagia. While I may very well end up being asked to minister to these people, that decision is not mine to make. In the terrors of yesterday I had placed that burden entirely on my own shoulders. In prayer, Isten has graciously lifted that burden onto Himself. Thanks be to God. After gathering myself (or, rather Isten picking me up off the floor, if I am honest), I spent time talking with Panael and meeting what remains of the Church here in Redwraith. Panael is indeed a paladin, tasked with assisting and guarding the bishop. He is carrying a lot of guilt for “allowing” the bishop to be murdered. When he explained what happened in the aftermath of the battle, I understand now how an opportunity arose for those that wanted the bishop dead. Under the necromancers, every citizen of Redwraith went through a rite of passage in which they receive what is called a “Thanati Worm.” It is a painful experience, I understand, as the necromantic creature buries itself into the base of the neck. Once there, it is impossible to remove without killing its host. While it does feed from those who receive the worm, recipients heal much faster than normal; however, they are immune to magical healing and magical damage takes more time to heal. Once a person infected by these vile creatures dies, they rise as undead unquestionably dedicated to the defense of the city. Panael explained to me that most of the older generation of Istinites who converted (like himself) went through this rite and in order to avoid becoming undead, it is the practice of the local Istinites to chop off the heads of their dead (killing the worm before it gets a chance to works its heinous magics). In the aftermath of the battle, this task was left to Panael. It was while he was making sure his Istinite friends did not become undead that the bishop was killed. There is also a younger generation of Istinites that have been hidden away from the Necromancers and thus do not have the worm. It begins to make sense why the Church is so hated in the city. What might be understood to be a civic duty — taking the worm and allowing the worm to turn you into a bulwark against the city’s enemies — are eschewed by Istinism. At least now, with the death of the necromancers, our young no longer have to fear being discovered. I don’t see why any of these lovely and hurting people would ever contemplate murder. Holton lives! We raided the hobgoblin and spider lair in the wee hours of morning and managed to get one of the vile creatures to lead us to where Holton was chained to the wall guarded by some kind of ape. The creature also led us to believe that there is an unnatural breeding program going on underneath the city and we mean to stamp it out. First, I must attend to not only Holton’s wounds, but our own. Most of us are recovering from the strange venom of the spiders, which brings with it spams and paralysis. Fortunately, its effects are temporary. Isten, give us strength to rid this city of this evil! Yesterday was the Feast of St. Haralambos, also known as the man who would not die. He was a 3rd century priest when he was arrested at the age of 103 or 113 depending on the source. He was subjected to multiple tortures: flesh stripped from his skin, dragged by horses, iron spikes driven into his flesh, flames, etc. He not only endured it all, but miracles poured forth from him convincing many who witnessed these things to become Christian. Admittedly, I struggled to find a way to apply St. Haralambos’ story to RPGs. Yesterday was also a very busy day for me, so in the end a gave up and let my Saintly Saturday post pass. Then, as I was going to sleep, a thought came to me about Damage Resistance. This then led me to think about my own attempts to use it (despite my negative experiences with it while playing 3.5) in an attempt to remedy D&D’s weakness for simulating why armor disappeared from the battlefield once guns were introduced. I playtested DR and guns and it was not fun. The impetus for this is a campaign that keeps boiling up every now and then as a consequence of meditating upon the lives of the saints: a fantasy version of Alaska. As folks who have been reading this blog for the past several months know, my Gamer ADD has been surprisingly focused upon SWCL its possibilities. I have been pleasantly surprised by how forcing oneself into the minimalism of SWCL how easy it is to express really complicated ideas and worlds. So, my tired, Haralambos-addled brain started to wonder what would happen if I were to apply SWCL’s minimalism to guns in an attempt to emulate the transition away from armor that happened when guns became prevalent? The problem is Armor Class. D&D’s combat is all about over-coming armor and guns made armor largely irrelevant. Thus, there has to be a minimalist way that guns can ignore AC. As far as I am concerned, the simplest mechanic to use would be the Save. A magic dart unerringly strikes a single target for 1d6 damage. This, of course, bears little resemblance to a muzzleloader: the range is off as well as the accuracy; however, this allows for some fiddling to make this "Magic Wand" function more like an 18th century musket or pistol. Bowmen did not fire at individual targets in battle, they fired at an area in volleys. The Range given in SWCL can be interpreted to be either short range or point blank range and therefore its effective ability to target individuals could be increased to upwards of 300 ft. which seems reasonable given combat conditions. Napoleonic era tactics had 100 yards as the outside effective range for a volley of musket fire. This would place an effective SWCL range for targeting individuals at 25ft. Given the classic image of the 18th century duel, this sounds fairly reasonable. Muzzleloaders are infamously inaccurate, so targets should be able to make a Save in order to avoid damage. In terms of frequency (given the short range and the Save) and given the time to reload, it could be ruled that a gun may be used once per combat. A gun that may be fired once per combat. Target must make a Save or take 1d6 damage. As I have stated in the past, I am not a huge fan of modern science fiction. That doesn’t mean I don’t hope that there might still appear on the horizon a good or even great modern sci-fi tale worth taking in. Thus, I occasionally dip my toe in the water to see if anybody comes close. Altered Carbon happens to be one of those tales that does get close. For those who have not yet taken a look at the new Netflix sci-fi show, it is based on a 2002 novel by Richard K. Morgan about what might today be called a transhumanist culture where people’s consciousness is recorded into what are called “stacks” and inserted into different bodies. Originally intended to be a means of space exploration (transfer your consciousness to a body light years away without having to physically cross space), it ends up being used to create a man-made version of immortality. 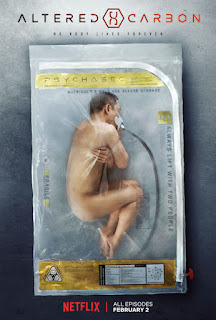 To its credit, Altered Carbon does a very good job of depicting what a world without God looks like: it is hedonistic, brutal and miserable even for those who hold all the wealth and power. It is the Marque de Sade writ large. It also acknowledges that Christianity (in this case the “Neo-Catholics”) would stand in opposition to the idea of stacking. Unfortunately, like much of entertainment today, the mouthpieces for what passes for a theological discussion are cookie-cutter, inflexible, intolerant and have the rhetorical skills of a piece of cardboard. This show could have been great had it taken this aspect of the story more seriously, because it is a fascinating exploration of what is the soul, what does it mean to be human and where does God fit in to all of this. Christianity has long maintained that the body is an integral part of the human person, Christ became incarnate in order to save us, after all. Thus, from very early on, people have been asking the question where in the body does the soul reside, because one doesn’t want to go around getting manicures if the soul happens to reside in the fingernails. This last observation is the most intriguing in terms of Altered Carbon because that is where the “stacks” are placed inside the body. Therefore, it could be argued that they contain a human soul based on the part of the body they function in. A conversation could be had about whether or not the whole soul was contained therein (having left behind both the heart and the arteries) but the Church has long been comfortable with organ transplants. 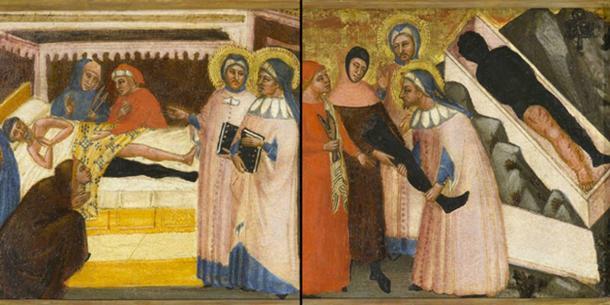 The first recorded transplant was done by Sts. Cosmos and Damianos (a leg) some sixteen hundred years ago. Due to the fact that a donor is preserving life, there has been no serious objections, even to heart transplants other than the admonition that the recipient is now responsible for not only their own soul, but for that of the person who saved their life. Thus, from a practical and theological point of view the objections that the Neo-Catholics have for the “stacking” technology bear little resemblance to historic Christianity. That doesn’t mean the Church wouldn’t have objections to the society depicted in Altered Carbon and the way it uses stacks. As I stated above, the human body is an integral part of the human person. Preserving one’s consciousness or even one’s soul does not mean that the human person is being preserved. More critically, however, is the use of clones by the uber-rich to emulate immortality and the treatment of human bodies in general (they are derogatorily called “sleeves” as if they are clothing rather than people). Despite the fact that cloning technologies are popularly associated with science fiction, clones already exist among us: they are normal called identical twins, triplets, etc. I have been blessed to know several pairs of identical twins in my life. While it is almost spooky how similar twins are in their likes and dislikes, etc. there is no question that each one of them is a unique and unrepeatable human person. It would be considered unconscionable for the eldest twin to “own” their sibling because they came from the same genetic code or for one twin to harvest the organs of a living twin because those organs “belong” to them. In other words, when we gain the ability to make clones of ourselves, each and every one of those clones will be a unique and unrepeatable human person in the same way identical twins are. To treat them as property to be used to emulate immortality would do so on the back of slaves. Actually, they would be worse than slaves, because even their basic humanity would be denied them. They are just “sleeves” that aren’t even allowed the freedom to consciously be forced to serve their masters. 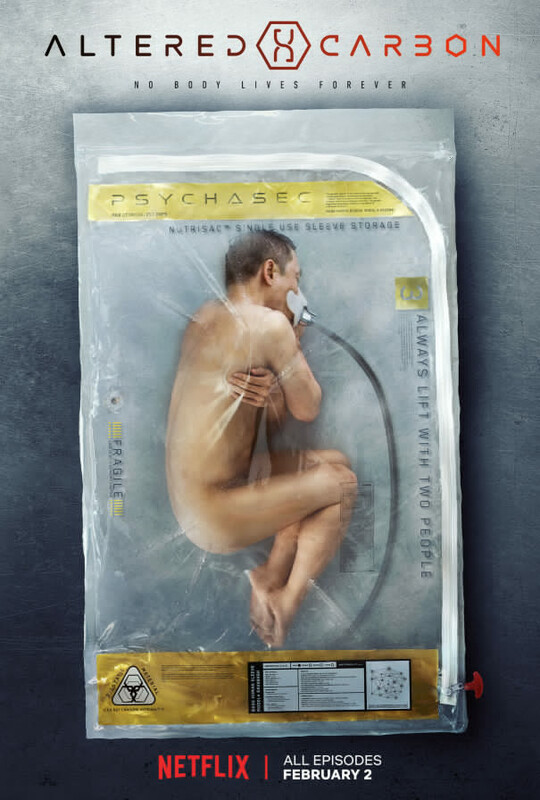 At the core of the story told by Altered Carbon is the question: What does it mean to be human? Specifically, is death part of what makes us human? A society that has replaced God with demigods who fake their immortality through technology is depicted as vile, violent, stagnant and bored. It is even hypothesized that they have ceased to be human. Had this show bothered to have more than a cardboard caricature of Christianity (and a fundamental misunderstanding of it to boot), this show could have plumbed the depths of the questions it asks in a far more interesting and, dare I say, entertaining way. It could even have been one of those great science fiction tales. What a vile and horrible place Redwraith is! I desperately want to go home and just spend my days mixing ingredients to make salves and medicines. Why I am here I do not know. I will admit that, while I was terrified as we approached the city, some of my fears gave way to awe when we came upon the main gate of Redwraith. We had heard rumors that a giant beast had attacked the city, but I had no idea how huge the thing was until we saw the skeletal remains still poised to break down the walls of the city. Its mouth is now used as the main gate and a horse drawn wagon can easily fit through. The bones of the creature now provide some shade and shelter to a tent city filled with merchants shouting out to customers and trying to sell them all sorts of things I had never imagined, let alone set eyes on. Morivam inquired one such merchant about a dagger he had squirreled away in the back of his tent. I was quite taken aback when I saw that the weapon was forged steel. The man rightly had an asking price of 100 gold coins for such a fine and rare weapon. Once, when I was a child, a friendly dwarf traveling through Headwaters on his way to the Bronze Citadel was kind enough to show me a small ingot of steel. He intended to make enough money off it to “make his son,” what ever that means. Since that day, this dagger is only steel I have ever had the privilege to see. Of interest (to me at any rate), the merchant tried to convince Morivam to purchase the weapon before the Dwarves did, because they were buying up all the steel they could afford. How on earth did so much steel suddenly show up in Redwraith? I was so intrigued and, dare I say, excited that I completely failed to notice that some of the City Guard watching the gate were actually undead. It wasn’t until we found the Lost Wyvern Inn (evidently the only Inn in town that survived the battle) that I realized the true horror of this place. The Inn actually had raw brains on the menu for its undead clientele and my meal was served to me by an animated skeleton. No wonder the citizenry of this place didn’t think it macabre to sell its wares in the shadow of a dead thing. Lord, please tell me why Fr. Valinor insisted on me coming to this horrid place. I really just want to go home. This trip has been very revealing about my companions. Morivam is insatiably curious. Now that we have arrived in town, he is constantly asking questions and getting into conversations with complete strangers. He even insisted on getting a room so that he could study some of the items we found in the gnoll camp without interruption. I have known Cuinn since I was a child. He always seemed to be a gruff sort of person that you would want on this sort of venture, but not really someone you would sit down and eat dinner with; however, he is a surprisingly gentle soul. He was the first of us to realize the extent of the danger I was in as an Instenite cleric in a town filled with undead and he made sure that not only if I was okay but that he had my back, as it were. Tenel took one look at the food and service of the Lost Wyvern and noted that there was a serious business opportunity here in town. He figures that some good old fashioned halfling food and hospitality could radically change the way these people look at food and service. I am afraid that my first impression of Holton may very well have proven correct. He has disappeared on us. He probably lost himself in the crowds and is gone forever. While Morivam studied and Tenel kept watch, Cuinn and I decided to chase down a piece of information the yellow mage picked up in one of his conversations: there is a sick house possibly run by Istenites. We are looking for a person named Penael. The northern part of the city is in ruin. Evidently, that was the only flank that the invading army had any kind of success. I must say I almost felt sorry for these people. The Sick House was cobbled together from one of the buildings that still had most of its wall intact. A make shift roof of oiled canvas sheltered those within. Inside we found a number of beds occupied by people struck by disease or recovering from what looked to be magical wounds. Both Cuinn and I have skills at healing and we very quickly offered our assistance. There was a young man by the name of Grick who seemed to run the place and he was grateful to have another pair of hands. Cuinn and I spent the day giving comfort. On one of the more severe cases, a young girl who had burns on much her body, I tried to use my healing magics. They did not work, but Grik took notice and scribbled a note which he secreted to me while clandestinely showing me that he wore an Istinite Wolfhook. Had we found the Church? Could we finally get in touch with the Bishop so that I can go home? Lord, will the horrors of this place never cease? Why do you try me so? Is this why you called me to this place? To be surrounded by this savagery everyday the rest of my life? Why me, O Lord? Why me? I must make apologies to Holton. I thought basely of him. When we made to follow the map Grick had given me to find the Church here in Redwraith, we were put upon by those same talking spiders that we encountered on our way here. They informed us that we had two days to bring them an elf otherwise they would eat “our Elfsie spy.” The poor soul must had been abducted the moment he went wandering alone. To boot, Cuinn has informed us that he believes hobgoblins have infiltrated the city and he thinks he knows one of the places they are hiding. But, Lord have mercy, this is not the worst of it. The bishop is dead. Murdered in his own chamber. The Church has been decimated. Only a dozen of them survived the battle. Like everyone else in the city, they manned the walls. Unfortunately, the Istinites were largely on the northern wall. So many were killed on the day of the battle. Have they even had a chance to properly bury their dead? Truly God, how can going from happily taking care of the sick in Headwaters to living in constant terror be a promotion? Why me? 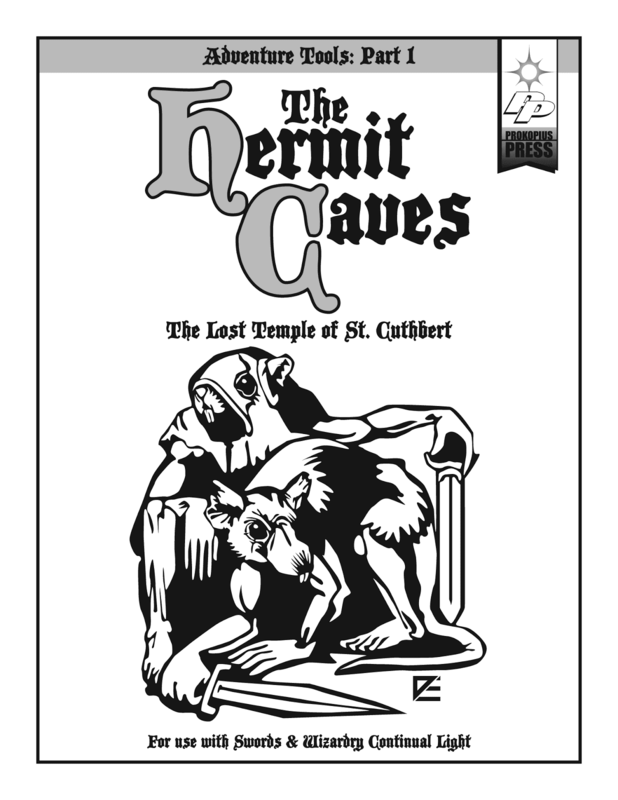 I've been slowly grinding away at my own version of The Temple of Elemental Evil, and I have finished the first section: The Hermit Caves. As I mentioned in a previous post, I am releasing this SWCL megadungeon piecemeal. In this way, I can get the parts of this project I've finished out more quickly (as opposed to waiting until the whole project is done), but I also get to experiment with the design goal of flexibility. 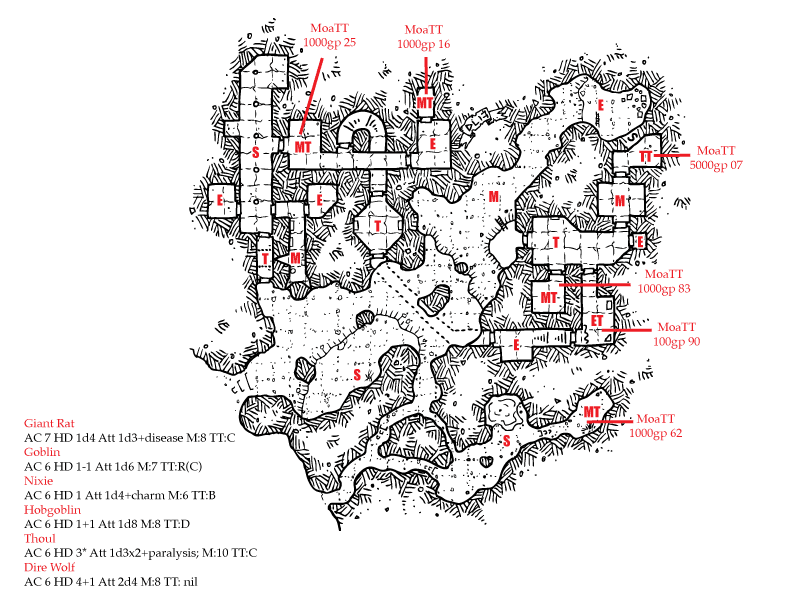 This module can be run as-is, easily attached to an existing dungeon or be used in conjunction with my other MyToEE adventures. As per usual, this comes with the disclaimer that I am a hobbyist and have edited this as best as I am able, but there will be mistakes. Please consider the comment section a thread for any typos etc. that you catch. Thank you! Lord, now let Your servant depart in peace, according to Your word, for my eyes have seen Your salvation, which You have prepared before the face of all people, a light to enlighten the Gentiles, and the glory of Your people Israel! In other words, Simeon is asking God to allow him to die just as God promised him. On its face, this seems like an odd thing to say. That is, however, until you read about his life. According to the tradition of the Orthodox Church, Simeon was around 360 years old when he met Christ at the Temple. He was on of the Seventy Jewish Scholars that answered the call of Ptolemy II, Pharaoh of Egypt, to translate the Old Testament into Greek so that it could be included in the Great Library of Alexandria. Initially, the plan was for all seventy scholars to independently translate the Pentateuch (the first five books of the Old Testament) and then gather together to see what the differences were and argue from there. When they gathered together again, all seventy translations were identical. It was therefore accepted as a divinely inspired translation. What eventually came out of that work is today called the Septuagint (coming from the word for “seventy”). When we read the New Testament (written in Greek) all of the quotes of the Old Testament come from the Septuagint. Interestingly, the Septuagint is the oldest version of the OT that we have. The Hebrew version of the OT we have today (called the Mesoretic Text) is itself a translation made by Jews who wished to get rid of all the Hellenic influence out of Judaism after the fall of Jerusalem in the 1st century A.D. It is considered a translation because the original Hebrew did not have vowels. Thus, it was possible to make several different readings out of the same passage by inserting different vowels. The earliest Mesoretic Text we have dates from the 9th century A.D. Today’s English OT translations are based on the Mesoretic, not the Septuagint which explains why there can be such variance in the quotations the NT makes of the OT. You shall see these words fulfilled. You shall not die until you behold Christ the Lord born of a pure and spotless Virgin. 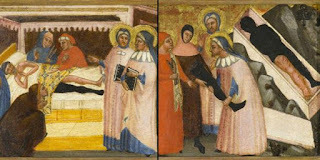 Thus, Simeon lived in anticipation of being able to die for almost four centuries. I am fascinated by this story because it subverts expectations. How many people throughout time have fantasized (and even sought) a way to cheat death? The whole vampire phenomenon is rooted in this primal desire. Yet, here is Simeon hoping to die and even asking God Himself to allow him to taste death. 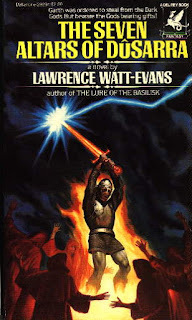 It also reminds me of one of my absolute favorite characters in all of fantasy fiction: the Yellow King from Lawrence Watt-Evans’ The Seven Altars of Dusarra. In context of an RPG, he plays the role of patron. He is the one who sends the main character on his quests. What makes the Yellow King stand out, however, is that his goal is not money or power but rather, much like Simeon, he is an immortal looking for something that will kill him. This, of course, is an awesome template for an NPC in any RPG, let alone a FRPG: the patron that pulls strings behind the scenes and helps out the PCs but whose real agenda is actually totally against all expectations. As I have often repeated on this blog, one of the best things about RPGs is its ability to surprise. An NPC who appears to do one thing that narratively makes sense, but is actually doing something completely different is one of the most entertaining surprises we have available to us.